Firstly I must apologise for my very long absence from blogging, for which I have no real reason. I have been making as much stuff as ever, but I just haven't felt the need to document it. 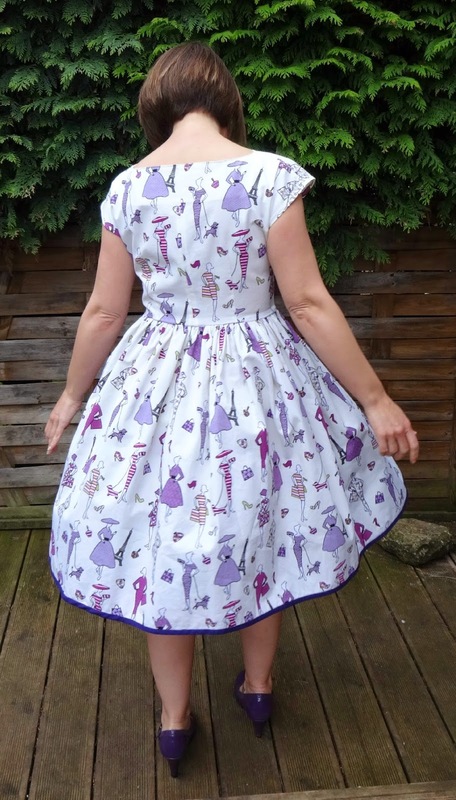 The reason for today's post is a dress which I felt compelled to create because of another blogger who is getting married in May this year and in whose honour a sew-along was created. 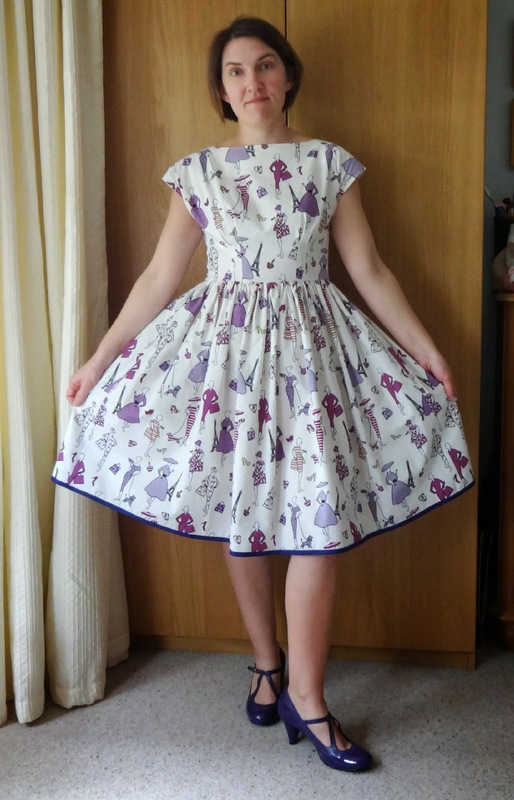 I have been reading Roisin's blog for a while now and it always makes me smile, plus, she makes A LOT of pretty awesome dresses. Seriously, does she have a second home for her clothes? Coming back to my blogger programme, I see that I had first intended to post about the Anna dress back in August of last year. I had bought the pattern after seeing some lovely versions made up by sewing bloggers and I duly completed my very first dress. The fit of this dress is great straight out of the packet but unfortunately the cheap-ish cotton I used to make it looked fine on the bolt but, I think has the unfortunate appearance of a hospital gown when made into an Anna. Buoyed by it's sort of success, I then went on to make another for my daughter when she needed a frock for a wedding she was going to. 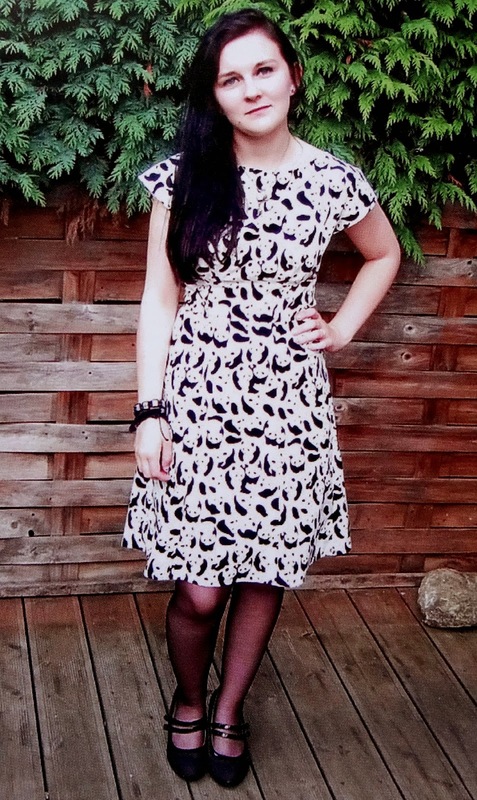 At first I was really sceptical about the print that she insisted upon but I think it looks brilliant as a dress and had to concede that my daughter was right. So, apparently my fabric-choosing skills are sadly lacking when it comes to dress making. Unfortunately, my computer has decided to hide my old pictures away in an as-yet undiscovered file so you will have to make do with a hanger shot and a picture of a photo! I love how you can't tell what the print is until you get close and then suddenly you think 'Oh, Pandas!' Note to readers: my daughter looks decidedly unimpressed with her frock, but actually, she loves it. That's the closest thing you'll get to a smile from her. Fabric-wise, I had read about the sew-along and had toyed with the idea of participating, but then, browsing through some home-furnishing fabrics whilst looking for some fabric to make a present with, I came across this fabric which immediately shouted 'Roisin' at me. May I present 'Anna in Paris'. Because of the print, I knew that the seven-piece Anna skirt would look very odd unless I was prepared to pattern match and waste metres and metres of fabric (I wasn't) so a gathered skirt it was to be. As a complete dress-making novice, I now realise that pleats might have been a better choice as they would not only have been more flattering, but they wouldn't have taken a whole morning to do because of repeatedly snapped gathering threads. I french-seamed the bodice sides initially, until I realised that my gathered skirt had a front piece and a back piece and therefore nowhere to insert the zip at the back, so I did an ordinary seam up the back and finished it with bias-binding. I un-picked one of the side seams and placed the invisible zip there instead. The waist seam was also bias-bound although the gathers made this a bit tricky, but the dress sits well on me so no harm done. I was just going to do a bias-finished hem too but I really liked the contrast so I decided to show the binding on the outside. It was also a perfect match for my purple shoes, which I bought years ago but have never had an outfit to match. I can even twirl like a princess and not feel remotely stupid as a middle aged woman doing so. Ahem. I'm not quite sure where I will wear this dress (although I will most likely be heading to Paris over the next twelve months) but I really enjoyed the challenge of making it and learned some new techniques along the way. I love the bias binding on the hem! I did that with my #sewdollyclackett too (which is yet to be photographed). I have also recently had the whole gathered/pleated skirt issue and am now searching for the perfect generic pleated pattern that can be easily adapted. We'll see how that goes. Perfect dress for this sewalong! Thanks for your comment Jess. Yes, a pleated pattern would have been helpful, perhaps next time I can engage my brain to do the maths and give pleats a try. I certainly won't be in a rush to make gathers again! I'll look forward to seeing your sew-along dress. I love your dress! Yes I do! I think it's a lovely silhouette on you, and we middle aged gals deserve our twirls too! Well finished, and I love the idea of an invisible zip in the side seam! Thank you Sue, that's lovely of you to say. I do feel very comfortable with the fit of the dress and I love the fact that I can sit down on the ground and completely hide my legs! I can't claim to be clever for putting an invisible zip in the side seam, it was sort of forced upon me by the skirt but it does work well.